Base of Operations: New York City, U.S.A.
Powers/Abilities: Thermo had the ability to extract thermal energy from others by touch to increase his strength and speed. He could release thermal blasts of concussive force from his hands. It is not known to what limits his powers may have lasted or how long these increases in abilities would last. It is also not known if he had to keep absorbing thermal energy to stay alive or if he would eventually die if deprived of said energy. If this were the case, then he could be considered a thermal vampire. He may have a limited form of flight or gliding power as shown in the issue of Quasar but not revealed elsewhere. (Marvel Team-Up I#108 (fb) - Dr. Walter Michaels and his wife Christine were scientists who created a process to transmit synthetic vitamins directly into the body with the help of microwaves. Walter insisted on trying the process on himself against the advice of his wife and his best friend and assistant Paul Bradshaw. He then entered the experimental bombardment chamber wearing a special suit designed to regulate the amount of microwaves and protect him, but he instead absorbed an extreme dose of radiation that left him weak and dazed but otherwise unaffected. A few days later while in the lab, a male nurse tried to take his temperature and on contact, Dr. Walter Michaels inadvertently absorbed his body heat and killed the nurse. He then realized that by absorbing body heat, he could amplify his strength and speed, as well as focus blasts of energy from his hands. Becoming more infatuated with his powers, he then fled the lab. 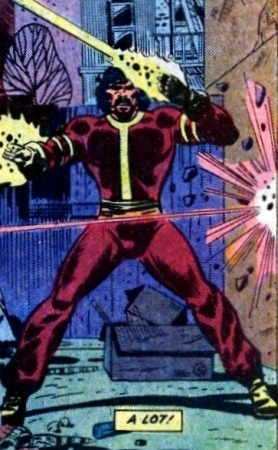 (Marvel Team-Up I#108) - While walking through a New York City alley, Thermo absorbed the thermal energy from two muggers as they were trying to rob him. He later read in the "Daily Bugle" newspaper that he had been dubbed the Street Stalker and, in anger, declared out loud he should have been given a more nobler name, such as Thermo the Thermatronic Man. Spider-Man and Paladin caught up to him but, after a brief battle, he escaped. After returning to his lab and seeing his wife in the embrace of his friend Paul Bradshaw, he angrily slapped his wife and then grabbed Bradshaw by his throat, accusing them both of having sabotaged the equipment so that they could be together and then slowly and painfully murder him. Having been previously contacted and hired by Dr. Christine Michaels to find him, Paladin and Spider-Man tracked him down. During the ensuing fight, Paladin was force-blasted through a plate glass window while Spider-Man was smashed into the wall of a nearby theater, which startled Dazzler who was inside her dressing room. He again force-blasted Spider-Man into a wall hard enough to put a hole in it, and then grabbed him by the throat and was about to absorb his thermal energy. (Marvel Team-Up I#109) - Dazzler appeared from inside the theater and released a flash of bright light that startled Thermo, who then decided to let Spider-Man go and leapt over a fence as he was not prepared to fight three heroes; he then escaped into the streets. He found an abandoned building to hide out in but soon learnt that a cult inside was trying to summon a demon. The leader of the cult knew that the summoning of the demon was a sham to dupe his followers but at the same time, Thermo entered the room. Thinking that Thermo was a lunatic, the cult began to protest until they were shown a demonstration of his powers, which quietened their protests. The leader of the cult realized that Thermo must be a deranged person, but chose to go along with the ruse in the hopes that he could make use of the mutate. 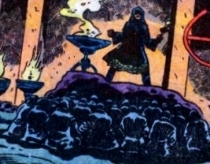 After haranguing the phony congregation, Thermo told them all that they were to be the core of a new movement to sweep the planet and promised to turn them into an invincible army. One of the cultists declared him to be a fraud and was killed when his thermal heat was absorbed by Thermo. The rest of the cult then bowed to him in worship as he told them he had a mission for them. Not long after, the cultists broke into the lab of Christine Michaels and abducted her, also stealing the microwave chamber. Dazzler was likewise abducted from her dressing room by Mark Hamilton and the rest of the cult when she thought they were fans. Spider-Man and the Paladin tracked Thermo down again, smashing their way through a wall to get inside and battled him once again. Distracted by the fight, Dazzler joined the fray when the cult lapsed in watching her. Using a device designed to neutralize Thermo’s powers, Spider-Man placed it upon Dr. Michaels’ head and within seconds, consumed his stored energy, rendering him unconscious. It is presumed he and the cult were later taken into custody, but this was never revealed. (Quasar#21) - Thermo unsuccessfully tried to raid the Fantastic Four’s headquarters in the Baxter Building, but was savagely beaten by Quasar who had an office inside. Due to his injuries, he ended up in hospital in a stable condition and was presumably taken into custody. (Captain America I#411) - Thermo attended the AIM weapons expo. Watching a fighting display hosted by Batroc, he bet Sunstroke $5000 that Crossbones (actually Captain America in disguise) would win the next round. (Captain America I#413) - Learning that Crossbones was Captain America, Thermo and the hundreds of other villains present attacked him. He was quickly dispatched and was shown lying unconscious on the floor. (World War Hulk: Frontline#3/2 - BTS) - Thermo had kept a low profile during the events of the heroes' Civil War and chose not to register. He began looting abandoned buildings that had been evacuated when the Hulk and his Warbound arrived in New York. (World War Hulk: Frontline#3/2) - He was shaken down for information by detective Danny Granville and the alien Warbound member, Korg, who were searching for information regarding the murder of fellow Warbound member Arch-E 237. He was held aloft atop a highrise by Korg and could not provide any pertinent information. He was dropped on his head soon after and they left him unconscious lying on the top of the building's roof. Comments: Created by David Michelinie (writer), Herb Trimpe (pencils) & Mike Esposito (inks). After appearing in Marvel Team-Up and being able to hold his own against three heroes like Spider-Man, Paladin and Dazzler, he turned out to be a dud when it came to fighting Captain America even with the help of hundreds of other powerful villains. Maybe after being drained of his thermal powers fighting Spider-Man, Paladin and Dazzler, he was no longer able to absorb body heat effectively as he once did. Having only appeared in three comics in total, maybe he just realized he was a lame character and went into hiding realizing that although he could absorb thermal heat from others, he sucked and really wasn’t so hot after all (pun intended!). Mark Hamilton led his cult into an abandoned building in the hopes of summoning a demon of great power named Yogoth. Unknown to the rest of the congregation, he was a phony and misled them into believing he was really able to do so. As he pretended to call forth the demon, Thermo appeared. At first, the cult thought Thermo was some sort of lunatic, but were soon silenced when he displayed his powers. Mark Hamilton decided to go along with him in the hopes that he might prove useful. Thermo convinced the cult to worship him as a god and that they were to be the core of a new movement to sweep the planet. Thermo sent them on a mission to kidnap Christine Michaels and Dazzler, and steal the microwave chamber. They were later quickly defeated by the combined force of Spider-Man, Paladin and Dazzler and presumably taken into custody shortly after. None of the cult members were named except for Mark Hamilton.